MA Fine Art Site & Archive Interventions aims to produce creative practitioners whose work already reflects a sense of historical documenting, mapping and cataloguing wishing to approach the interaction with audience and history from an inventive and strategic standpoint. It enables students to respond creatively to ‘place’ through a structured project, developing artwork presented to identified audiences at the researched site, archive or in alternative contexts. MA in Fine Art offers two Awards in full time or part-time mode with an annual intake starting in September: MA Site and Archive Intervention runs in parallel with MA Fine Art Studio Practice. The MA Fine Art utilises the international profile of the staff research team and creates the possibilities for effecting dynamic shifts in cultural production. The employment opportunities today are greatly increased for post-graduate students suitably experienced as artists/arts professionals working in the expanded field of art practice, which is reflected in the content of this course. The Postgraduate Programme gives students the opportunity to realise an ambitious ‘Fine Art Project’ to define and sustain a high level of professional practice supported by a ‘Contextual Report’ which undertake an analytical, critical and creative approach to theoretical formats. It also explores strategies for research publications to create potential employment opportunities, dissemination of practice and publicity networks. The MA Fine Art has a modular structure providing students with the opportunity to research, plan, develop and realise an independent Postgraduate Programme at first Post Graduate Certificate, Diploma and then at Master’s level. The MA modules in Fine Art encourage student interaction, sharing experience and participation and critical debate (Research Methods, Professional Practice, Degree Project & Contextual Report) and two specialist Introductory and Project development modules. Please contact us if you have any questions or would like further information on how to apply. Mini Archive of Anarchist Interventions. 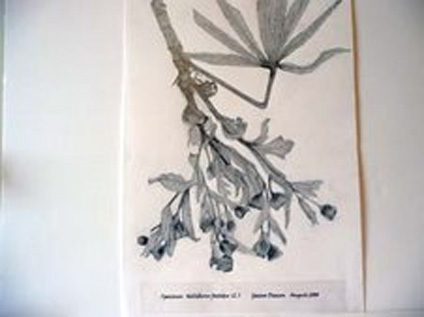 Steph Fletcher had a small selection of drawings, publications and ephemera on display at the Centre for Contemporary Art in the 2013 MA Fine Art show. These works explored and celebrated anarchist history encouraging the imagination of a free, equal (and perhaps utopian) world where worklife is revolutionised as a pursuit of nurture, sustenance, creativity and pleasure. These interventions form part of a broader practice, which aims to question why we continue to fight for revolutionary ideas that have failed repeatedly in history as well as interrogating the hybrid artist/activist role. For this MA exhibition, held in the Centre for Contemporary Art, the visitor centre of a nature reserve was simulated. Four large photographic images were displayed in light boxes, along with texts, maps and a showreel, with the collection of books and research materials used. A nature table invited visitors to touch smell, taste and feel a collection of plants, leaves, seed pods and nuts. The project investigated the issues involved in classification as complexity is removed and individuality or character is lost, exploring the use of signs and representational imagery, philosophies and ancient belief systems, cognitive science and how images are interpreted by our brains using our senses, memories and past experiences, to see how this ultimately affects our perception of certain plants. 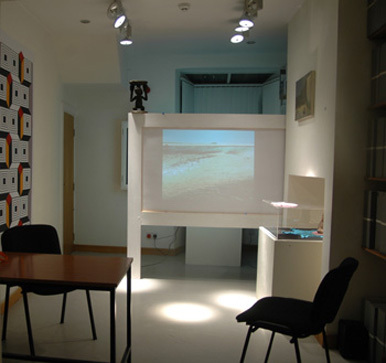 Her MA exhibition was held in the Centre for Contemporary Art, Preston in 2007. The pieces on show were lent by members of the black community to display different ways of visualising black people that were acceptable, aiming to add to the debate about black art theory and the history of black art. The animations on show were abstract and the ‘female’ element of the exhibition, using the creative processes inherent in weaving, wall-painting and pattern making and transferring them into digital technology – shredding data to make abstract animations. Patricia Walsh is a multi-media artist working with audio, video and photography. She creates atmospheric and reflective art-works, that feature music, voice, found sounds, texts or composite imagery, all of which attempt to bridge the shifts of time. Her works often suggest the possibility of other dimensions, unseen presences and immeasurable distances, and have resonance too with unruly, fractured or discordant recollections. Recently she has contributed a soundtrack to the words of writer Joyce Makwenda, in The Global Village/Lost Horizon mix, broadcast online as part of Claudia Wegener’s Radio Continental Drift programme. She has curated a new Circuit Bridges sound-event, which was presented at the Media Factory Preston, in collaboration with David Morneau. This brought together sound works from selected audio artists based in the USA, the UK and Europe. This creative exchange concert will also be presented at Gallery MC, New York, in September, 2015. As a long standing member of Robert Voisey’s Vox Novus, she has previously curated a number of 60×60 sound events, notably at EDAU and the Harris Museum & Art Gallery. The Harris Flights project commissioned her sound-piece, Einen Augenblick and was part of the month-long architectural intervention project.